Interesting update coming from ABI research related to Pay-TV. According to the research firm, the global pay-TV market will continue to grow despite a decline in the North America pay-TV market in 2012. They forecast that global pay TV subscribers will reach 858.1 million at the end of 2012, a 5% year-on-year increment from 2011. The key growth will be driven by the Asian-Pacific market which is expected to add more than 27 million subscribers in 2012. Cable TV operators in United States have been facing a continuous decline in pay-TV subscribers. In the first two quarters of 2012, Cable TV operators lost nearly 0.8 million subscribers, although their broadband subscriber base has continued to grow. 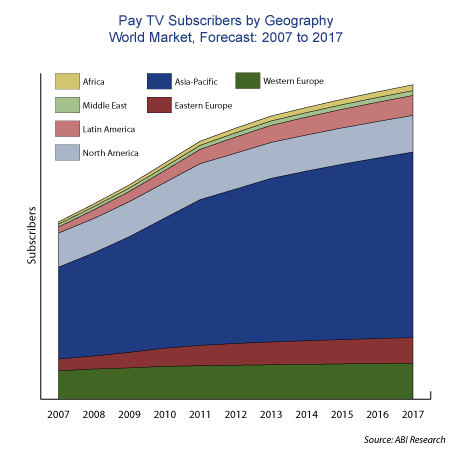 IPTV, which has less penetration than cable or satellite in the US market, gained around 0.6 million subscribers during the same period. More information about the assessment to be obtained directly from their website.